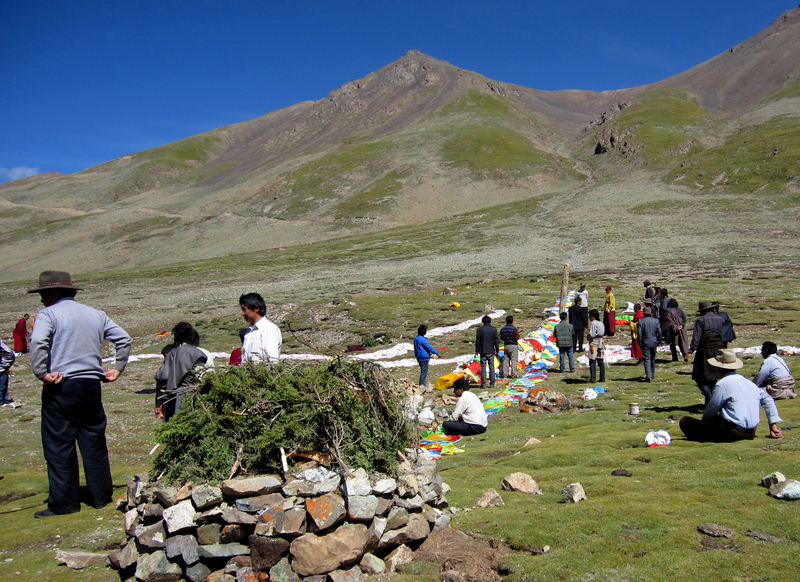 Reflecting the great significance that Chogyam Trungpa Rinpoche still holds for those who knew him in Tibet, some fifty relatives and friends of the family made a special trip to his birthplace in Geje, Tibet in September 2011. The photos accompanying this article, taken by Surmang Khenpo, are thought to be the first photos ever taken at this location. 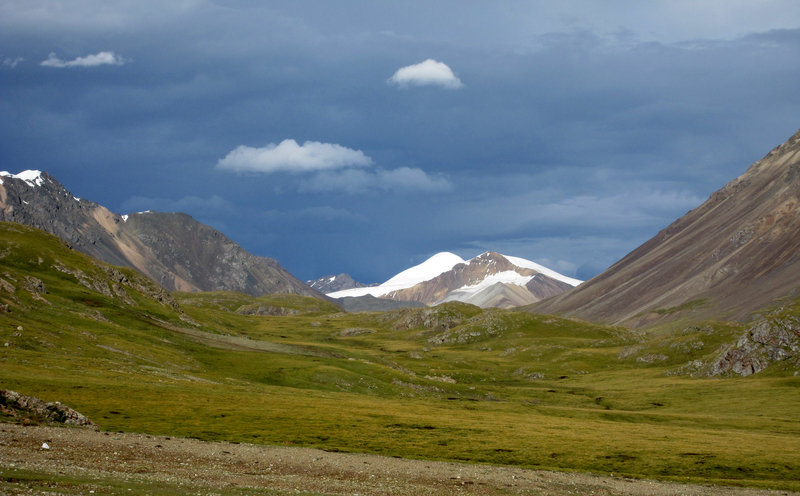 The birthplace is a spectacular locale at nearly 16,000 feet altitude in the Ngam River valley. 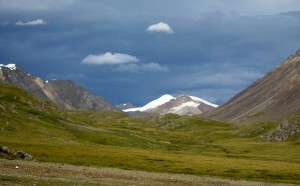 Nearby majestic mountains can be seen in the photos. 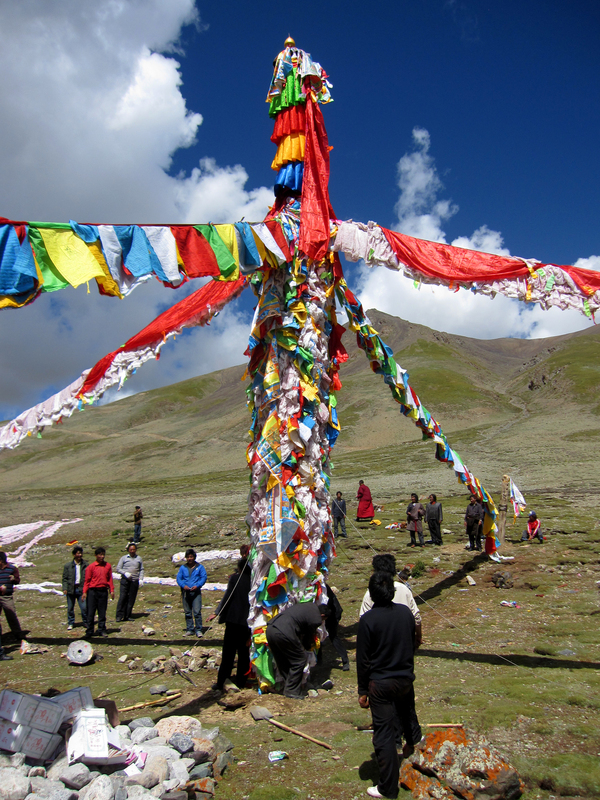 The locally famous triple peak of Palgod Punsum, abode of an important deity, is southeast of the birthplace by about forty miles, according to Karseng Rinpoche. 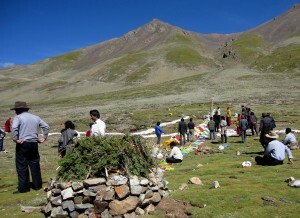 Karma Senge Rinpoche and Damcho Tenphel Rinpoche, nephew and brother of Trungpa Rinpoche, led the group. 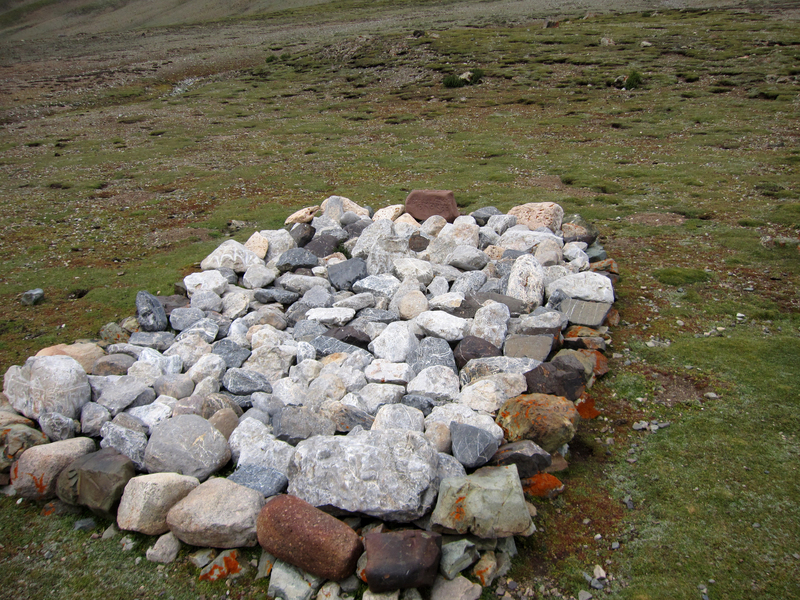 Karseng Rinpoche has long wanted to create some type of stupa or memorial for his uncle there. 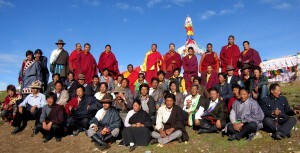 Chogyam Trungpa Rinpoche’s immediate family has lived in the Kyere area, south of Surmang, since 1959. However, his parents were from Geje and many of the relatives who joined the pilgrimage still live in that region, particularly in the town of Dzato. The group gathered in Dzato before departing for the birthplace. Although no relatives now live in the birthplace valley, some still graze animals in that area and the exact birth spot was marked long ago with a group of stones. 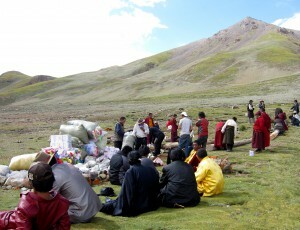 Although both Surmang and Geje are part of the former kingdom of Nangchen, the birthplace is some two hundred air miles northwest of Dutsi Til, and much further by road. 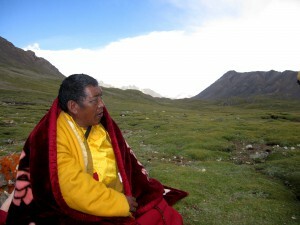 Karseng Rinpoche had never been to Geje before. 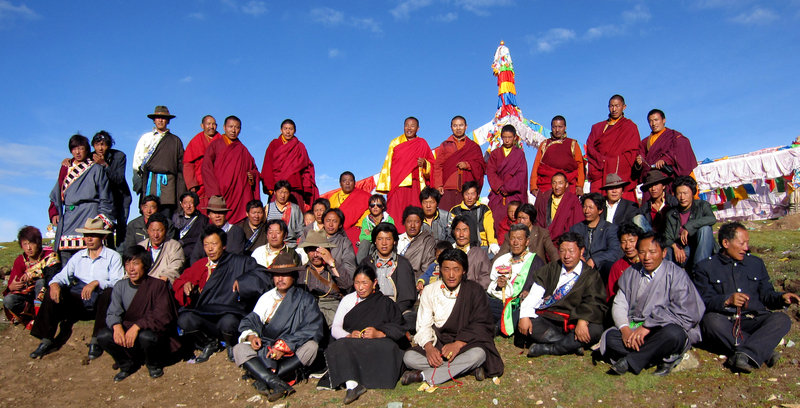 Damcho Rinpoche, who was born six miles south of Trungpa Rinpoche’s birthplace, had not been back since before 1959, although he visited relatives in Dzato on one occasion. In their two days at the birth location, the group performed a lhasang and a sand mandala practice, along with devotional practices. 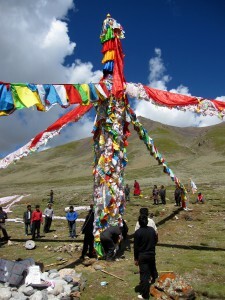 The photos depict the prayer flag mandala, anchored by a tsokshing, which the group created. 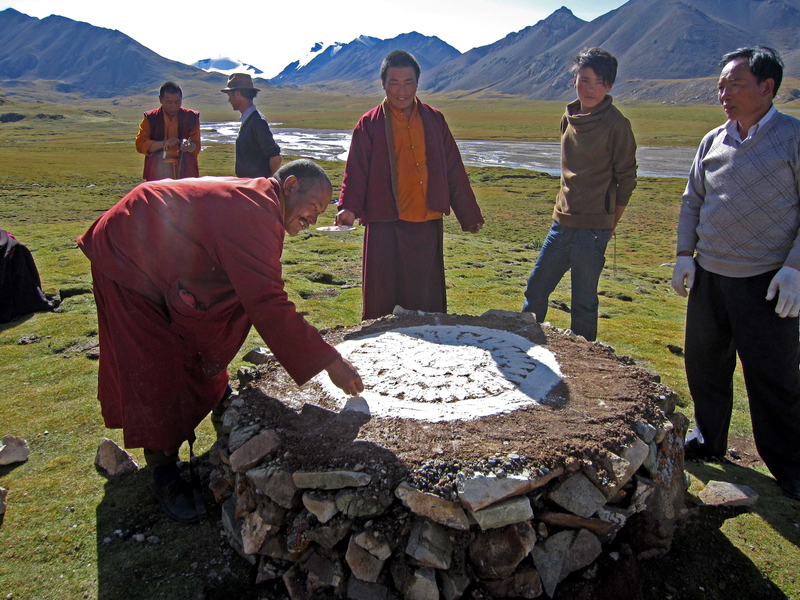 Video and additional photos of the birthplace can be seen on the new Konchok Foundation donation gift DVD: Glimpses of Chogyam Trungpa Rinpoche’s Life and Legacy in Tibet. A note about historical dates: Born in Tibet contains several minor date errors, presumably made by the English compiler of the book. One of these is apparently Trungpa Rinpoche’s birth year. A number of sources, including his family in Tibet and Trungpa Rinpoche himself (see the notes to True Perception), state that he was born in the dragon year of 1940, not in 1939. Everyone should also check out the Konchok Foundation’s “Glimpses…” DVD which has these photos and so much more.